ATECMAA PACKAGING was founded in 1985 by Robert and Patrick RASSINOUX, both enthusiastic supporters of technology and innovation. Very keen to ensure the highest quality of the sheet metal fabrication, they rapidly won a reputation for quality by developping film unspooling systems, brakes and innovative and highly reliable automation systems. The company filed various patents, in particular for film stretching systems. ATECMAA PACKAGING's machines are among the very few capable of stretch wrapping pallets of extremely light-weight products, such as tall pallets, and they have clear productivity advantages over manual film wrapping, which is more time consuming and uses more film. In 2008, the engineering team calls on a designer to work with them and come up with a new stretch wrapper answering two requirements: enhanced productivity with safety and a target price under $ 4,200/ 3000 Euros. The outcome is the BBLOG that features a very precise and efficient rotating arm for an unbeatable price. The same year ATECMAA PACKAGING supplies large end-of-line wrapping systems for primary packaging before shipping. ATECMAA PACKAGING manufactures its own handling equipment and delivers turnkey solutions. 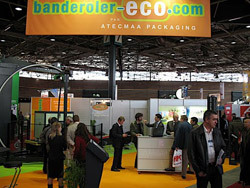 In 2009, ATECMAA PACKAGING sets up, Banderoler-Eco, a subsidiary specialized in renting stretch wrapping machines, along with providing a full range of services. LX stretch wrappers for larger fully automatic lines integrating on demand weighing, strapping and labeling resulting in productivity gains. The handling solutions evolve to provide turnkey lines and production sites. ATECMAA PACKAGING consolidates its leading position on the French handling and packaging technology markets.